Last month, Earthling had launched two spacecrafts to explore Mars – the Russian Phobos-Grunt with China Yinghuo-1 piggybacking and NASA Mars Science Laboratory Curiosity. Curiosity had a successful launch and now is on the way to Mars, but unfortunately for Phobos-Grunt, the engine of its Fregat upper stage failed to ignite and it is now stuck in low-Earth orbit. Currently, engineers are still trying to contact the silent probe, but without much success. You can get more updates from the web. These mission, however, are not are not the main topic of today. We can see that the launches always happened roughly 2+ years apart. Why? Because we want to launch our spacecraft during Mars opposition, and Mars opposition happens every 2 years + 2 months. The reason to launch a mission to Mars during opposition is pretty obvious – this is the time when Earth is nearest to Mars. However, the best time to launch, in terms of how much energy is required for the trip, is a few months before that happens (compare the launch dates above with the Mars opposition dates below). In spaceflight term, the time period in which a particular mission must is launched is called the “launch window”. If a spacecraft wants to meet with another spacecraft (for example a Soyuz wants go to the ISS), or go to a planet, an asteroid, or any other objects in space, the launch must be carefully timed so that the orbits overlap at some point in the future (meaning both objects will meet each other in the future). If the weather is bad or a malfunction occurs during a launch window, the mission must be postponed until the next launch window appropriate for the flight. But why do we need a launch window? Why can’t we just find where Mars is now, point our rocket and launch it any time we like? To answer that, imagine you are standing in the middle of a field watching a 400 m running race in a stadium. Now, if you want to catch one of the runners, how would you do it? One way would be to simply chase the runner, and provided that you are fast enough, you might eventually catch him only after using up lots of energy and travelling a long way. Not efficient. A better way to intercept your target is simply to walk to the other side of the running track. It uses a lot lesser energy and time to get there. But there is a catch – you have to time your walk carefully so that you reach there at the same time as the runner does. If too early, then you’ll have to wait; if too late, then you’ll miss him completely. The same thing applied in spaceflight. Now you are Earth and the runner is Mars. The calculations are actually more complicated then the example above since both Earth and Mars are moving in space. In order to reach Mars, we do not aim our spacecraft at where the planet is now, because by the time we reach the planet has already moved and is no longer there. Instead, spacecraft will travel in an elliptical orbit around the Sun that will eventually intersect Mars**. If the spacecraft reach the intersection point too early or too late, it’ll miss its target. (In the above example, if you are early you can wait, but in spaceflight a spacecraft cannot wait.) So timing the launch to allow a spacecraft and Mars to arrive at the same point and at the same time is important, and that’s how launch window comes in. If you miss your launch window, you miss your target. The distance between Earth and Mars, the launch vehicle’s power, the spacecraft’s weight, and the desired geometry of approach to Mars are all factors in determining the range of possible launch dates. 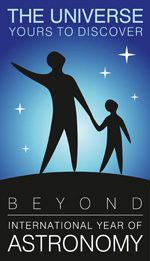 A launch vehicle from Earth will take advantage of the Earth’s spin for an added boost, which translate to fuel saving. The point at which a launch vehicle uses the least amount of fuel to push a spacecraft onto the proper trajectory for Mars identifies an ideal launch date. The length of launch window for a mission is often determined by the type of launch vehicle, which has been designed to launch a certain amount of load at a certain velocity. The farther the launch is from the optimal time for lift-off, the more energy needed to get to the target. If a rocket is just slightly more than enough to do its assigned job under the best launch conditions, the launch window becomes very narrow. The more energy a rocket delivers for a particular payload, the wider the range of conditions it can handle, thus the launch window widens. However, this consumes more fuels and money. Therefore, there has to be a balance between the mass of the payload and the energy capabilities of the launch vehicle. For a mission to Mars, launch is usually scheduled prior to an ideal launch day, but within acceptable conditions for the launch vehicle. This allows for weather-related delays or delays in getting the vehicle ready. Other launch windows include a range of days after the ideal launch date. If these windows were missed, the trajectory to Mars becomes more difficult, the thrust of the launch vehicle becomes inadequate, and the window of opportunity for a mission to Mars closes for another two years. *three is you include China, but China Yinghuo-1 was launched by Russian rocket, so here I take it as two. 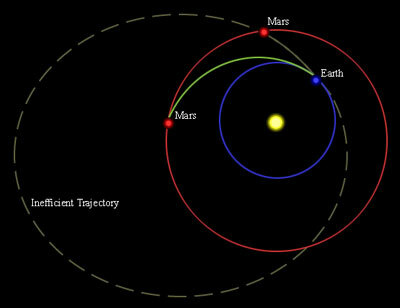 **In addition, the direction in which the spacecraft moves when it arrives should make it easy to match velocities with Mars, so that it is easier to enter Mars orbit. These trajectories and orbits are collectively referred to as Hohmann transfer orbits, first proposed in 1925 by the German engineer Wolfgang Hohmann. This will be a story for another post. ~ by thChieh on December 4, 2011.